If you're developing an API today for consumption by third-parties, you'd be more than forgiven for choosing the REST interface to develop the API, as it is a tried and tested standard for delivering data to consumers, as well as accepting changes to the data in a structured way. In more recent times, GraphQL has become an attractive alternative for developing APIs thanks to its flexible, semantic, and performant nature. But what if you'd like finer control over the details of the data exchange, including integration with third-party authorization servers using JWTs, and being able to quickly and easily set role-based permissions at the field level? 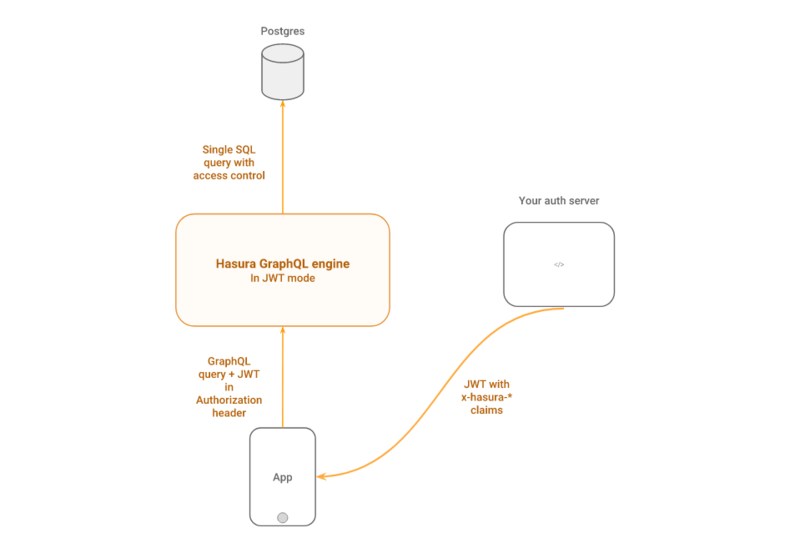 "The Hasura platform takes advantage of JWT and GraphQL technologies to provide a platform for querying and manipulating data in a PostgreSQL database, taking into account the role specified in the authorization token." 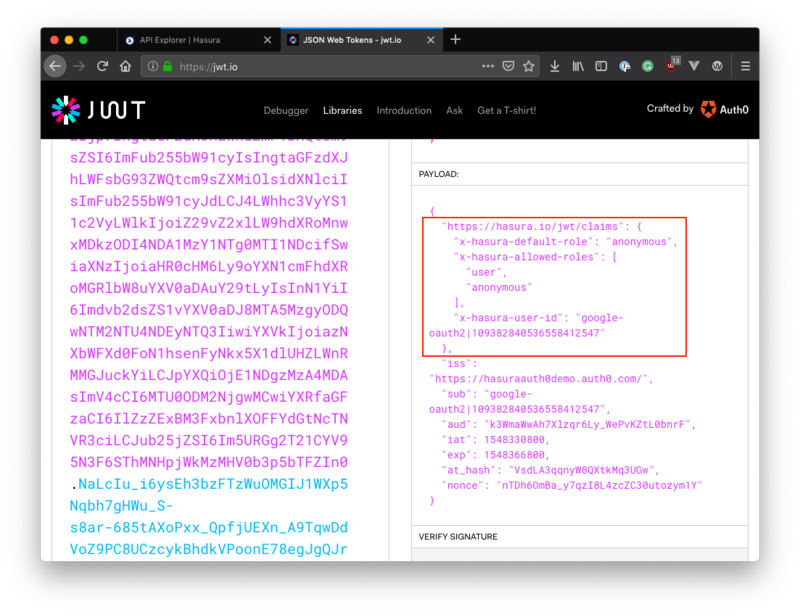 A JWT is issued as a result of a user authenticating with an authorization server. In the case of the Hasura platform, this JWT can then be used to authorize the request and as such can make queries and mutations depending on the claims present in the token. We will see how this works in the demo a little bit later in the article. The compact nature of a JWT makes it easy to pass around in query strings, headers, and request bodies, or store in a cookie. This describes a query for articles, returning the id, title, and the author's name. As you can see, it supports nested database objects (the author is another table in the schema, linked to from an article). Mutations can also be defined, which describe how to change data. In addition, multiple queries can be made in a single request, which is most useful when a client wants to retrieve lots of possibly unrelated data points from the server. The Hasura platform takes advantage of these technologies to provide a platform for querying and manipulating data in a PostgreSQL database, taking into account the role specified in the authorization token. The Hasura console allows the user to create a database, define its schema, and populate it with data. 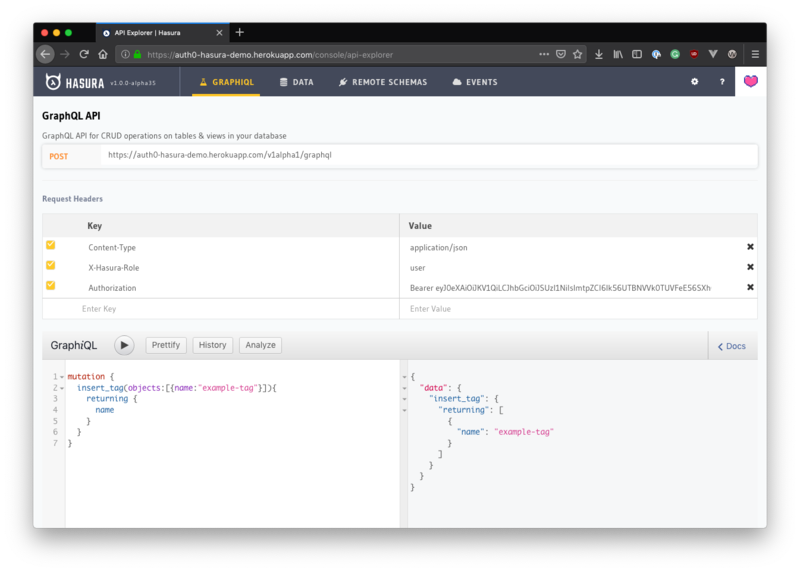 Hasura will then generate a GraphQL API on top of this database, automatically generating the appropriate types, queries, and mutations that allow the client to completely query for and manipulate the underlying data. Hasura takes a role-based approach to authorization, and as such an individual role's access can be narrowed down to only a subset of the overall schema (even down to the field level). As each role is mapped to certain authorization rules, it can even be prevented from running certain mutations if so desired. Furthermore, queries can be delegated to an upstream service based on the claims present in the authorization token. Custom claims inside the JWT are used to tell Hasura about the role of the caller, so that Hasura may enforce the necessary authorization rules to decide what the caller can and cannot do. These two keys define the possible roles as well as the default role in the absence of the "X-Hasura-Role" header. In the case of Auth0, these custom claims can be put in place using Rules, a platform feature that can be used to dynamically enhance tokens as users are authenticated. Let's have a look at how authorization with Hasura and JWTs works in practice. A demo has been set up that will allow you to construct queries and see the role-based permissions system in action. This demo has been pre-configured with a database that has authors, articles, tags, and a relationship table that joins many articles to many tags. Let's see how we can query for some of this data. 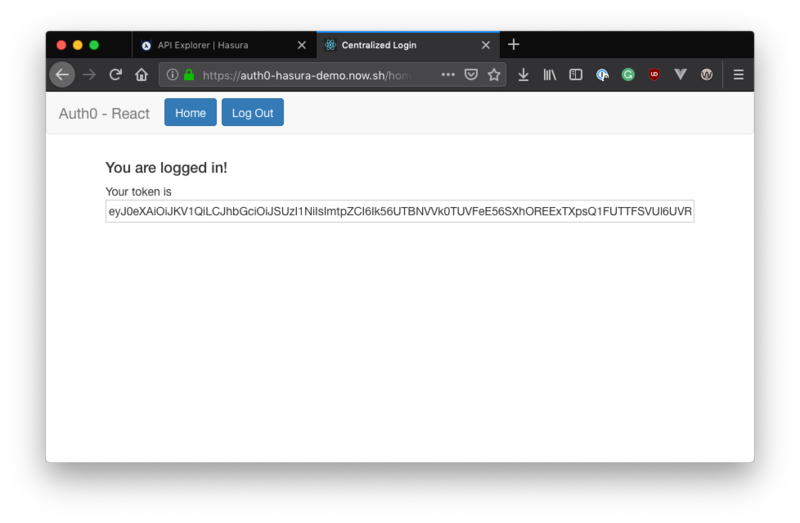 Browse to https://auth0-hasura-demo.herokuapp.com, and use "hasurademo" as the access key. To run the query, press Ctrl+Enter (Cmd+Enter if you're on a Mac), or click on the large 'play' button above the query panel. You will see the results of the query on the right-hand side of the screen; you have successfully managed to retrieve the results for two articles that are currently in the database! This is a mutation that inserts a new tag with your specified tag name into the database. You should replace the value <YOUR TAG NAME HERE> with a value of your choosing. Running this mutation right now will return an error, letting you know that the mutation does not exist. This is correct since the permissions have effectively been set up so that the anonymous role cannot make changes to the database. This is also indicated by the GraphQL API docs, as it does not show any mutations that can be called by this role. To see this, click the "< Docs" button on the right-hand side of the query window to open the API documentation. Only queries and subscriptions are available as root types here, but no mutations. Let's have a closer look at how permissions are set within the Hasura interface. You can see here that, since the "anonymous" user cannot modify or insert any data, it makes sense that there are no mutations available. Let's now switch to the "user" role and see how we can make this mutation work. Click the "Graphiql" heading at the top of the screen to return to the query interface. Now, change the "X-Hasura-Role" request header so that its value is "user". If you try to run the mutation again now, you will notice that it will fail for the same reason as before. This is because the "user" role needs to also provide a valid JWT in order to be properly authorized to run this mutation. 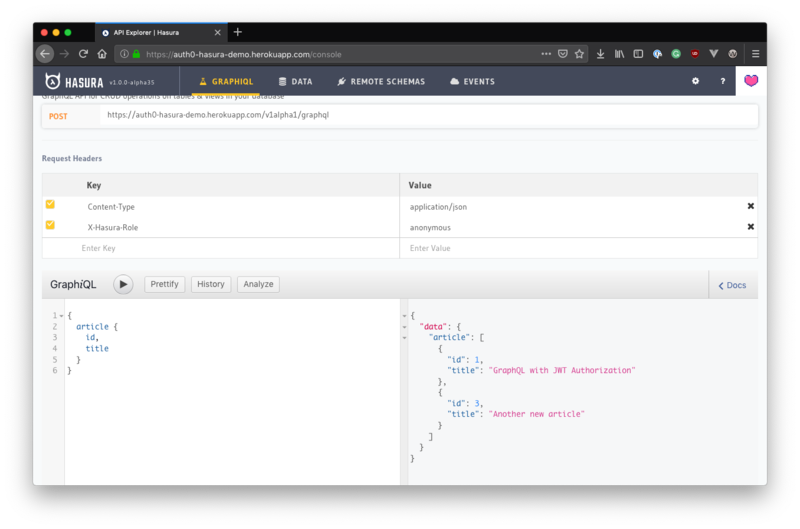 "Learn how to create a GraphQL API and secure it using JSON Web Tokens using the @HasuraHQ platform"
For the purposes of this demo, a tool has been provided to make it easy for you to generate a JWT and run this mutation. 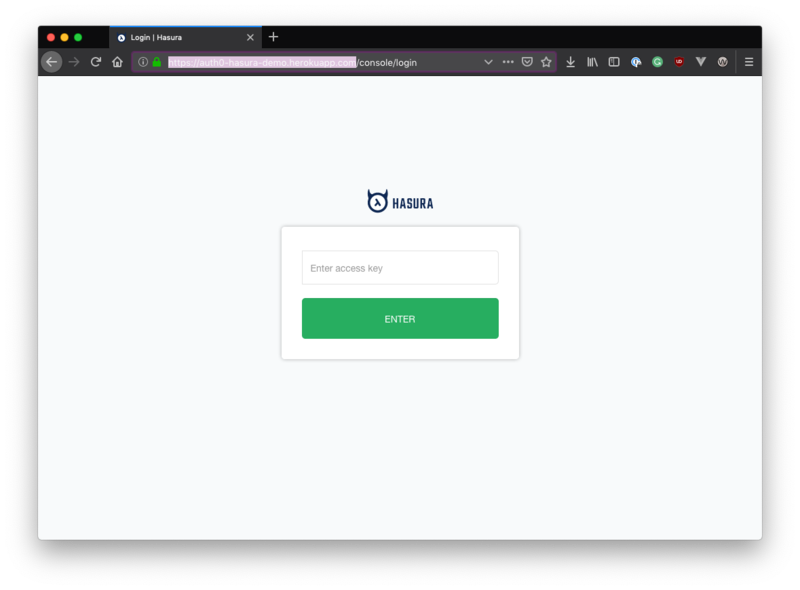 Browse to https://auth0-hasura-demo.now.sh/ and log in with your Auth0 account. If you do not currently have one, you can register for a free account. Note: In a real-world application, you would retrieve an access token directly from the authorization server when the user logs in, and use that in your requests to the GraphQL engine. This tool has been provided only as a convenience for the purposes of this demo. Once logged in, you will be able to see your token. Select the entire token string and press Ctrl+C (or Cmd+C on a Mac) to copy it into your clipboard. With the token still in your clipboard, head back to the Hasura console. The way we attach this token to the request is through the standard "Authorization" request header. Note: The "tag" database uses the tag name as its primary key. Since this demo is a cloud deployment that could potentially be used by many people, you should use your own made-up name for a tag as you cannot enter duplicate primary keys. If you have used a tag name that already exists, you will receive an error result in the query results window. Try running the mutation again with a different tag name. Finally, to prove that the mutation has worked we can explore the raw data in the database. Once again, click the "Data" heading at the top of the screen and then click on the "tags" table on the left. The resulting screen will show you the data that is present in the table, and you can see that the "example-tag" entry that was created by the mutation is there. 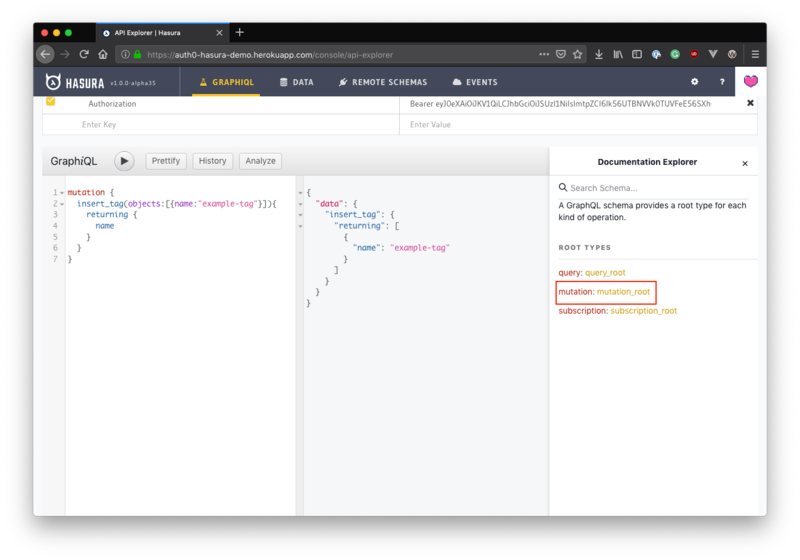 In this post, you learned a bit about GraphQL and the main differences from a traditional REST API. You also had an introduction to JSON Web Tokens, how they are made up, and how easy they are to pass around. Next, you discovered how Hasura tackles the idea of a role-based architecture when it comes to securing GraphQL APIs, and how it uses JWTs to authorize incoming requests and grant permissions to specific areas of the schema, even down to the field level. Finally, you had a practical look at the Hasura platform, learning how to perform anonymous queries, and how to perform authorized mutations using a JWT that was issued to you by Auth0. Based out of Bangalore and San Francisco, Hasura makes developer tools that simplify and accelerate product development. The Hasura GraphQL engine is an open-source service that gives you instant, realtime, high-performance GraphQL for any Postgres app (including on existing databases).